Incumbent PM Aleksandr Zakharchenko has won in Sunday’s elections in the self-proclaimed Donetsk People’s Republic in eastern Ukraine, taking some 75 percent of the votes. 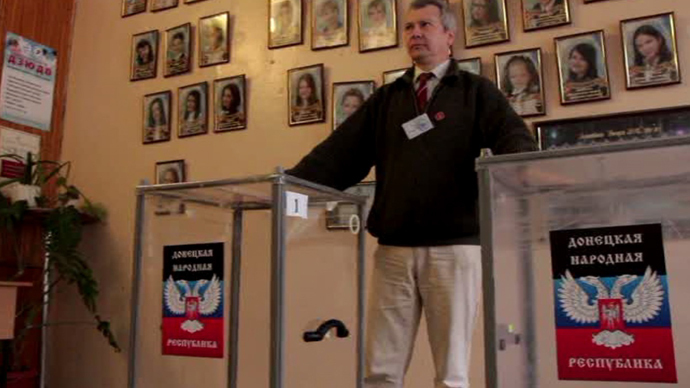 In Lugansk, 63 percent have voted for the current leader Igor Plotnitsky. 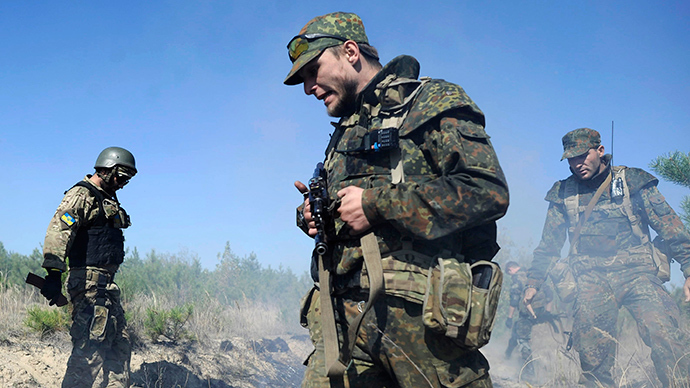 In Donestk, Zakharchenko was trailed by Aleksandr Kofman, deputy speaker of the Novorossiya Union parliament, and Yury Sivokonenko, an MP from the local Supreme Council. “After processing all the ballots, Aleksandr Zakharchenko received over 765,340 votes,” said Roman Lyagin, the head of Central Election Committee. “Aleksandr Kofman got 111,024 votes, and Yury Sivokonenko 93,280,” he added. Lyagin also said he doesn’t give percentage data, because he thinks that absolute numbers are more open and precise. Total voter turnout in the Donetsk People’s Republic reached 1,012,682. In Lugansk, Igor Plotnitsky, the incumbent leader, won with just over 63 percent of the vote, according to final results provided by the local Central Election Committee. Meanwhile, the lead in the parliamentary elections – also held on Sunday – has been claimed by Zakharchenko's Donetsk Republic party, which has 662,725 votes, the head of the Election Commission added. The rival Svobodniy Donbass party has collected 306,892 votes. In Lugansk, the incumbent leader and head of the Peace to Lugansk Region movement, Igor Plotnitsky, has won 69,42 percent of votes, while some 22 percent voted for its closest rival, the Lugansk Economic Union. The self-proclaimed people’s republics of Donetsk and Lugansk took to polling stations to vote for their leaders and MPs on Sunday. 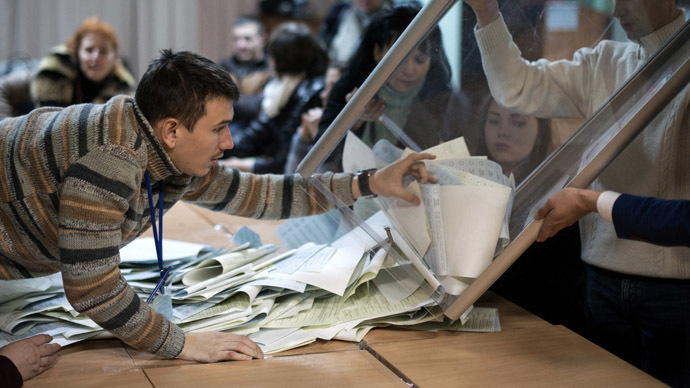 Over 360 polling stations were open in Donetsk for three million potential voters. Meanwhile, 102 polling stations for approximately 1.5 million voters were open in Lugansk. In Lugansk, the overall turnout exceeded 60 percent, according to the head of the Central Election Commission in the LPR, Sergey Kozyakov. He added that by 8p.m. local time, nearly 630,000 residents had come to cast their votes. Kiev has said it will not recognize the elections, as they contradict Ukrainian legislation. Ukraine’s Security Service has opened a criminal case against the organizers of the elections in Donetsk and Lugansk. EU’s new foreign policy chief Federica Mogherini has also spoken out against the elections, arguing that it will be an obstacle to reconciliation in Ukraine. “I consider today’s ‘presidential and parliamentary elections’ in Donetsk and Luhansk ‘People’s Republics’ a new obstacle on the path towards peace in Ukraine. The vote is illegal and illegitimate, and the European Union will not recognise it,” Mogherini said in a statement. Ukrainian President Petro Poroshenko condemned the elections as illegitimate on Sunday and called on Russia not to recognize the results. "I count on Russia not to recognize the so-called elections because they are a clear violation of the September 5 Minsk protocol, which was also signed by Russia's representative," he said in a statement. However, the Russian Foreign Ministry issued a statement late on Sunday saying that Moscow “respects the expression of will of the south-eastern [Ukrainians].” The ministry noted a high turnout and reminded that in the current situation it is “extremely important” for Kiev to work on conducting dialogue with the people of the region. Moscow earlier pointed out that according to the Minsk peace agreements, elections in both Ukraine and the self-proclaimed republics should be conducted between October 19 and November 3. Thus Poroshenko’s order from October 16, which set the date of elections in the self-proclaimed republics for December 7, “contradicts the Minsk agreements,” said the Russian Foreign Ministry. 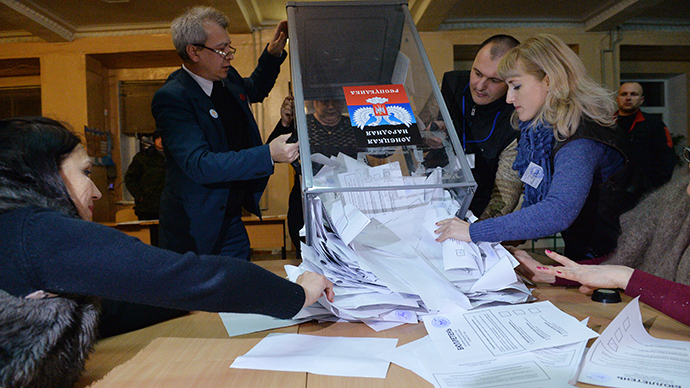 Ukraine conducted parliamentary elections on October 26. 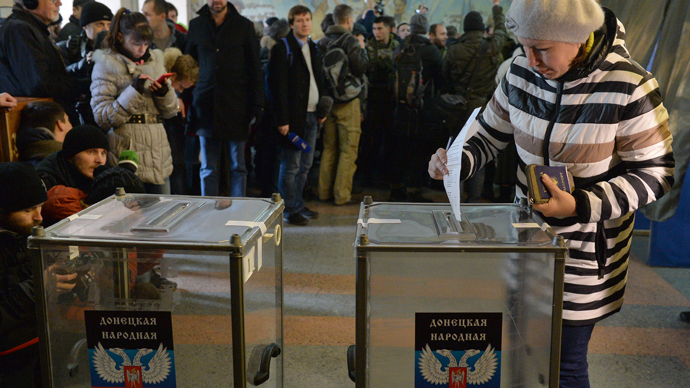 No serious violations of public order were reported during the Sunday elections in the DPR. "We have no reports about incidents at polling stations,” a DPR Interior Ministry spokesman told TASS news agency. Minor incidents included a false bomb threat. International observers said the elections in the self-proclaimed republics followed democratic standards, adding that they saw no violations during the process. An MP from the Upper Chamber of Italy’s Parliament, Lucio Malan, acting as an observer at the elections in Donetsk, told RT that people “were not influenced in any way” during the vote. “The prevention of double or triple voting appeared to be good, up to international standards” he added. “First I believe the elections followed international standards of democratic elections. I was very impressed with the enthusiasm and the vigor with which the people went to the polls to express their opinion,” US Senior Attorney Frank Abernathy, an observer in Lugansk, told RT.